The employees at Mercedes-Benz of San Antonio deliver more than 100 years of experience in the dealership business. But, there’s more to enjoy and experience at Mercedes-Benz of San Antonio than just amazing deals. They pride themselves on being friendly, knowledgeable, and courteous to everyone that steps onto the lot. You should be happy with your purchase, but you should also have every question answered. A Mercedes-Benz isn’t just a vehicle to get you from point A to B; it’s a distinct experience that has been carefully crafted by engineers for generations. Every Mercedes-Benz provides performance that no other vehicle can match. 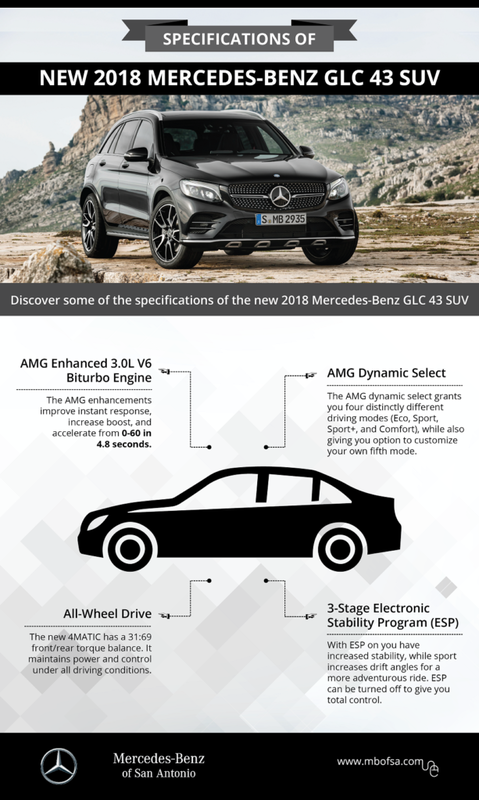 Learn some of the specifications of the new 2018 Mercedes-Benz GLC 43 SUV, and you’ll have a better understanding of what sets Mercedes-Benz apart. The AMG® enhancements for instant response do stand out, along with the increased boost, which offers 384 ft-lb of torque from 2,500 to 4,500 rpm. If you were worried about acceleration, you shouldn’t be. You’ll also enjoy going from 0-60 in just 4.8 seconds. Whether you’re looking for power or speed, the GLC 43 SUV has you covered. The new version of 4MATIC® has moved beyond any archaic notions of what you can expect from an all-wheel drive. The 31:69 front/rear torque balance maintains power, even under a hard acceleration. You’ll notice the difference when coming out of corners and under all driving conditions. With the new 4MATIC®, you have improved grip and handling, while retaining the agility and fun that you’d expect from a Mercedes-Benz. AMG® gives you four different and distinct modes (Eco, Comfort, Sport, and Sport+), and they each provide you with a distinctly different driving experience. You can even customize a fifth mode that allows you to have a unique handling profile that’s all your own. If you aren’t happy with what’s provided, you can always create a mode yourself. With ESP® on, any instability is detected. The response is reduced engine torque and braking intervention until the vehicle is back on course. The sport mode grants you increased break intervention, higher drift angles, and improved toque-reduction thresholds. You also have the option to simply turn ESP® off, so that you have total control. This is just a sampling of the latest innovations that Mercedes-Benz has in store for you.